This watercolor Winter Crabapples is a giclee print that was made from an original sold painting. Hand Signed and Titled : "ROUND UP AT YAMMIOKA ' KANANASKI'S COUNTRY by Chelan. 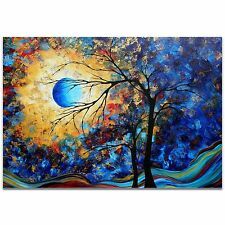 This canvas art is printed on the highest quality cotton canvas. Artist : Ivan Shishkin (1832 - 1898). Year of creation : 1891. made on unique linen textured paper that is heavy and fingerprint resistant. Museum of original : Kiev Museum of Russian Art, Ukraine. 19th CENTURY MUSEUM ART PRINT. FINE ART REPRODUCTION PAPER SUITABLE FOR FRAMING. PAPER SIZE 11" X 14". IMAGE SIZE 7" X 13". We have others from this collection up for sale this week. Made in the USA. Proverbs 17:22. Very pleasant unused calendar lithograph of quite lake or pond, surrounded by rocks and evergreen trees, snow capped Mountains in the background, rosy blue Sunset sky. 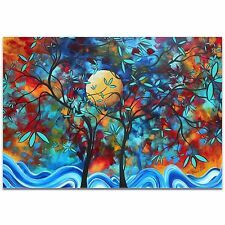 This picture would be a great wall decor accessory for your home or favorite hideaway. U.S.A made in Iowa. Found at auction in huge box of calendar prints, from nearby closed Calendar factory. It is a mass produced print, Not a Photo Copy. Measures: 5 x 7 inches unframed. Just like new. Excellent condition. Price is for one. No 69324 Questions? Please use the Contact Seller link and we will do our best to help. The shack is situated in the middle of the marshland. It was painted with acrylic paints in green, blue, yellow, white, and brown. This is a great print for ACEO collectors! One Blue Winter 16x20" art print on 100 percent thick cotton archival paper. Print is 16x20" with a 2.5" white border at the top and bottom and 2" border on the sides. Print is made from an original acrylic painting. FINE ART REPRODUCTION PAPER SUITABLE FOR FRAMING. PAPER SIZE 40" X 40". This is an archival print of an digitally created illustration. These prints are vibrant and fade resistant up to 200 years under glass and up to 300 years in an album. 5x7" Print. Nicole Wong's illustration have been featured in several. PAPER SIZE 38" X 44". FINE ART REPRODUCTION PAPER SUITABLE FOR FRAMING. IMAGE SIZE 32" X 40". An ACEO print of an original canvas painting of a fleur de lis with zebra stripes. It was painted with acrylic paints in pink, white, black and silver. This is a great print for ACEO collectors! Gallery Quality Acrylic Glazing with UV Protection. Hanging Wire Included for Easy Installation. Corner Protectors Included, with Dust Cover on Back. Made in the U.S.A.
FINE ART REPRODUCTION PAPER SUITABLE FOR FRAMING. PAPER SIZE 11" X 14". IMAGE SIZE 8" X 12". 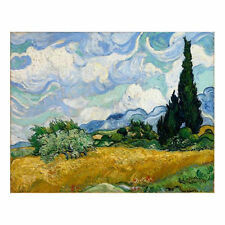 The painting has recently converted into a high-resolution giclee print, with all of the detail, brushstrokes and personality found in the original work. This landscape painting is crafted from rugged materials with durable finishes, giving the display longevity and versatility in both indoor and outdoor settings. Yelena Andrey. Subject is the Golden Gate Bridge. and the City of San Francisco. passing below the span. Print of what I believe to. Great for any special occasion too such as a wedding or party. Size: 70cm. x 70cm (27.5 in.). Material: polyester fiber. You can combine orders. "Amalfi Coast Sunset". Archival Inks Giclee Print on Premium Ultra Matte 400gsm Cotton Canvas |. Premium Canvas, 1½" Gallery Wrap. Fully Assembled Stretch Mounted Canvas which is ready to hang. Image Size :30" x 24". Original Limited Edition Serigraph on Paper. She has since received a Master of Fine Arts Degree form the University of Colorado in Boulder. Her work is now popular throughout the United States. Paula Crane. Haleakala Crater National Park, Maui Hawaii. 8 x 8 1/2 print is in very good condition. NO OTHER REASON will be asked or required. Original Oil Painting by Phyllis Tarlow. Ocean Waves at the Beach. I love the look of waves breaking and foaming as they move. toward the shore. The image is printed on 8.5"x11" 100% cotton rag Velvet Fine Art paper. So, of course, I said yes. As we drove through the gate, my friend said 'Look at all the air conditioners in all of the windows!'. I was noticing how many windows were on the house, each with it's own window unit, when I saw a car leaving the grounds. By Carl Valente. Out To Sail. The Land of Leptoro, Giant Trees and Water Ways. 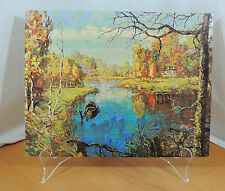 This is a professional photo print of my original watercolor painting For many years I’ve been engaged in painting. 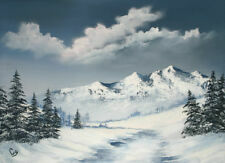 I am a graduate of the Academy of Arts and professionally trained in painting and drawing, as well as graphic design. Style : Beach Picture / Coastal Decor / Sunset Landscape Art / Old Pier Art / Foggy Water Art. The beach picture is a high resolution giclee print in brilliant hues of pale blue, gold, grey and brown on acrylic with an artistic high gloss finish.